The 2015 Chevrolet Malibu and the 2015 Toyota Camry are two of the most coveted midsize sedans on the market. Both models have developed a reputation for their spacious cabins, comfortable ride, and powerful engine options. If you're shopping this segment, we can understand why you'd find it difficult to choose between the two. Check out our four-category comparison before you decide which option best suits your individual needs. There's a reason the 2015 Chevrolet Malibu is known for passenger comfort. Its cabin is impressively upscale, reminding one of a luxury car. High-quality materials and the soft-touch dash create a welcoming space. The Malibu is also roomy, giving each passenger enough space to maintain a relaxed feeling during long road trips and commutes. Its cargo hold is large for this segment, offering a generous 16.3 cubic feet for grocery hauls and weekend luggage. The 2015 Toyota Camry isn't far behind, with one of the roomiest cabins in the segment. Even tall adults fit comfortably in the rear seats. The trunk offers a substantial 15.4 cubic feet of cargo space, falling just short of the Malibu. The 2015 Chevrolet Malibu is our pick for safety. In government crash tests, the Malibu came away with a perfect five-star rating for overall protection. The standard OnStar telematics system protects drivers in need with features that include on-demand roadside assistance and crash notification. An available rearview camera gives drivers excellent rear visibility. Shoppers can add the Advanced Safety package, which outfits the Malibu with a wealth of high-tech safety equipment, including rear cross-traffic alert and blind-spot monitoring systems. When it comes to safety, the 2015 Toyota Camry also has its high points. Its rearview camera is standard equipment. Shoppers who choose the more expensive trim models can add high-tech safety equipment, including a pre-collision system that uses adaptive cruise control sensors to warn drivers of impending accidents. Although both vehicles are powerful and fuel-efficient, the 2015 Chevrolet Malibu's overall engine lineup gives it the lead here. The Malibu's base engine is a 2.5-liter four-cylinder that makes a sturdy 196 horsepower and 191 pound-feet of torque. On the road, it achieves an impressive 25 city/36 highway mpg. The engine's start-stop technology works to save fuel when the Malibu stops in traffic. The Malibu's base engine is one of the strongest in its class, producing enough power to seamlessly merge onto highways or pass others on the road. Drivers can also choose the more powerful 2.0-liter turbocharged four-cylinder engine, which produces 259 horses and 295 pound-feet of torque. Even with its immense power, the turbocharged engine remains fuel efficient, achieving 21/30 mpg. This engine is impressively quiet, so passengers can expect a serene cabin at high speeds. The 2015 Toyota Camry's base engine is a 2.5-liter four-cylinder that makes 178 horses and 170 pound-feet of torque. Its EPA ratings aren't far behind that of the Malibu, at 25/35 mpg. Shoppers can also choose a 3.5-liter V6 that generates 268 horses and 248 pound-feet of torque. The Camry's optional engine is one of the quickest in this segment. 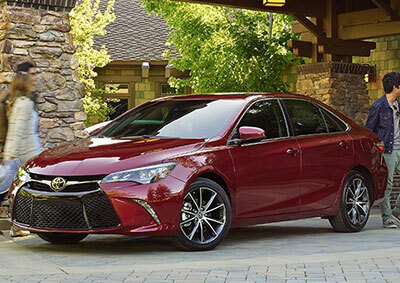 Both sedans can be equipped with enough features to rival more expensive vehicles, but the 2015 Toyota Camry is our choice because of its impressive standard equipment. The entry-level LE model comes with a standard rearview camera, helping drivers reverse safely. Keyless entry saves time in the parking lot. Toyota's Entune touchscreen interface gives users access to an array of infotainment apps. The 2015 Chevrolet Malibu's base LS model gives drivers plenty of comfort and convenience features. Like the Camry, it comes with keyless entry. Full power accessories make it easy to get comfortable in the cabin. Bluetooth phone connectivity lets drivers make hands-free calls. Its standard OnStar technology comes with a 4G LTE Wi-Fi connection to turn the Malibu into a mobile hotspot. Both sedans are modern and family-friendly, but the 2015 Chevrolet Malibu is our all-around pick. Inside, driver and passenger have enough space and supportive seating to stay comfortable during long commutes. A long list of features lets drivers create a high-tech, luxurious cabin. On the road, both Malibu engines are designed to deliver both power and fuel efficiency.